A fun and colourful activity book, full of cars, trucks, boats, planes, trains and other vehicles for children to draw. 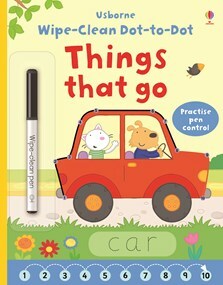 Each page features a different vehicle, with ten dots to join to complete the picture and the outline of the vehicle’s name for children to write over. Provides a fun way for children to practise counting, writing and pen control – all essential preschool skills. The wipe-clean pages and special pen mean that this book can be used over and over again.